Sestra Geek Girl Heather Thayer is back with a squeeing review of Station Eleven, by Emily St. John Mandel! I recently finished Station Eleven, and for a long time I couldn’t communicate coherently because I was still so wrapped up in the world of the book that nothing else seemed to matter. 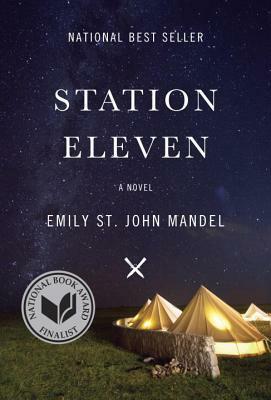 Station Eleven is, at its most simple, a tale of the apocalypse (a flu epidemic), held together by following the pre- and post-apocalyptic stories of a people loosely connected to an actor who dies in the first few pages of the book. In the “bookclub notes” in the back of the book, one of the questions is whether there is a main character in the book. I would posit that there is not, and the book is all the richer for it as we follow the very different characters to or through the end of the world. It is difficult to describe just why or how this book excels in every way. Looking back on it, the sensation is of being embraced by a warm dream – a vivid dream of the end of everything. A dream of hope and nostalgia; a dream of life, determining what is important, and what we hold on to when everything we know is gone. Written with prose that somehow manages to be both wistful and gripping, it doesn’t let words get in the way of an exquisitely drawn world, experiences and characters. So many books that win awards (this one has won several, including the Morning News Tournament of Books), have overwrought writing that drown the subject in words, reveling in their own cleverness, but this book is clean and enthralling – letting the story speak for itself. One doesn’t notice the writing as one is carried along by the narrative and the mood of the book. This is the kind of book that makes a person leave a party early so that they can go home and keep reading. Yup, that happened. Through a compelling narrative with interesting characters, the book explores the ways that people create art, celebrate life, preserve the past, and do more than simply survive. While the larger themes are there, they hover in the background and do not get in the way of the story. It is only afterwards, when it is impossible to stop thinking about the book that one notices that there was all this meaty stuff in there to chew on and mull over. Find some time, read this book, and marvel at the wonders of the world. This entry was posted in Book Reviews and tagged Emily St. John Mandel.